Due to the multiple areas of application of the microencapsulation, many different types of capsules exist nowadays, which can be reduced to two basic structures, however. The core/shell particles are „real” capsules with a clear distinction between the internal core zone containing the agent and the surrounding shell. This type of capsule is especially preferred, when an instant release of the agent is desired, following a certain period of time during which the shell is degraded. Matrix particles, on the other hand, consist of a homogeneous distribution of carrier materials and agent(s). Spherical particles in micrometer scale are often termed as microspheres. 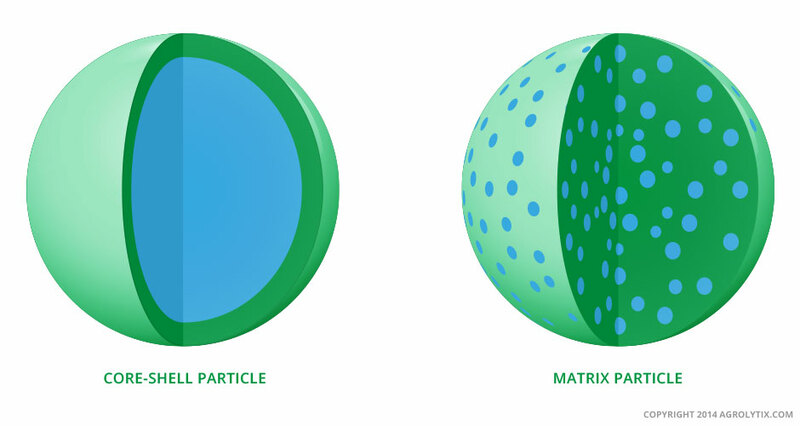 Due to their homogeneous distribution inside the microspheres, the agents reach the sphere surface and are consequently released at different times, which results in diverging release profiles. The agents’ release kinetics can be specifically changed and adjusted according to customer requirements or environmental conditions through the choice of the carrier material as well as the addition of additives to the matrix particles.